The world’s most powerful portable battery generator. The popular Pro-B3 battery generator provides fast recycling, action freezing flash durations and yet unbeaten battery capacity. 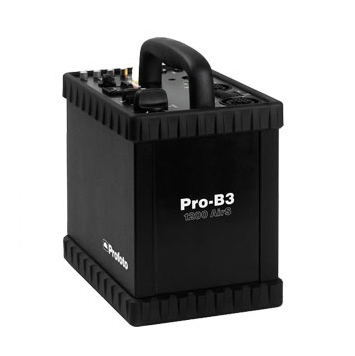 In addition, the Pro-B3 is one of the most durable battery packs on the market, and its reliability has been proved over and over again during the years that it has been a firm favorite at rental studios worldwide. The LiFe battery’s huge capacity allows for extensive shoots on location. The LiFe battery probably offers the longest battery lifetime on the market. Fast recycling guarantees that you will never miss that perfect moment, waiting for the flash. Action freezing flash durations even at full power to provide razor sharp exposures with minimal motion blur. Unrivalled reliability, proven through years of heavy-duty use in rentals worldwide. Two asymmetric lamp outlets and 8 f-stop power range results in an easy and versatile setup. The 250 W modeling light makes it easy to set the light. Wireless sync with the Air system.